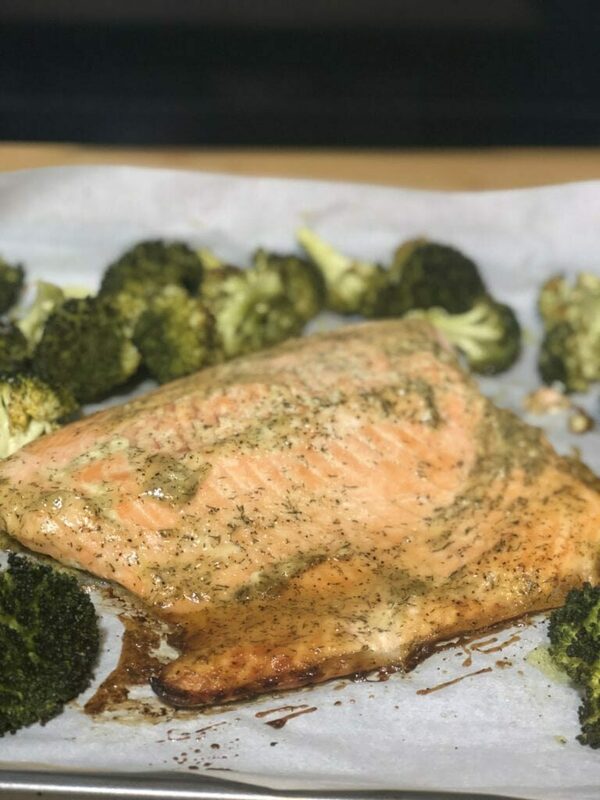 Sheet Pan Baked Salmon with Mustard Dill Marinade - So Easy! 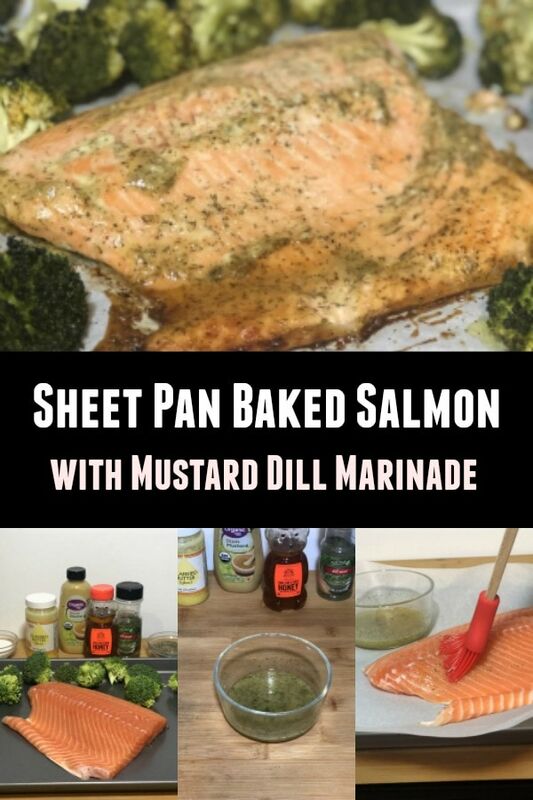 Sheet Pan Baked Salmon with Mustard Dill Marinade – So Easy! You will love this delicious and healthy baked salmon recipe. Plus you make in on one sheet pan in the oven so it is perfect for those busy nights. The mustard dill marinade is the perfect combination of flavors for the baked salmon. You know those nights where the time just gets away from you? You look at the clock and you have about an hour before dinner. Thankfully this salmon dinner is all made on the same baking sheet pan. It’s so incredibly easy! This is a fantastic recipe to save for really busy weeks. It’s super simple. In fact, if you make it just once, you won’t have to look at the recipe again – especially if you make some extra marinade. Yup! It has homemade mustard dill marinade! The bit of the mustard mixed with the fresh tang of dill on the flaky fish…let me tell you…it is incredible. There are a few ways to cook salmon. You could grill it, broil it, or pan fry it. But my favorite is to bake it in the oven. I love how cooking salmon in the oven just incorporates all the juices and flavors into one. Another benefit of cooking salmon in the oven? You can roast veggies on the sheet pan at the exact same time – saving you dishes and effort. So, how do you cook salmon in the oven? It’s so easy! Just make sure it is well marinated. Then, bake it in the oven for 20 minutes at 375 degrees. Dinner is served! If you want to see my step-by-step instructions, read on. I have a printable recipe card at the end you can skip to if that’s easier. The first step is to mix up your marinade. You’ll need to let the salmon marinade for at least an hour, so every piece of meat soaks up the spices. While you are doing this, preheat your oven to 350 degrees. The marinade is only four ingredients. You can even make extra and use it again on pork or chicken. It even makes a killer salad dressing! Line a baking sheet with parchment paper. 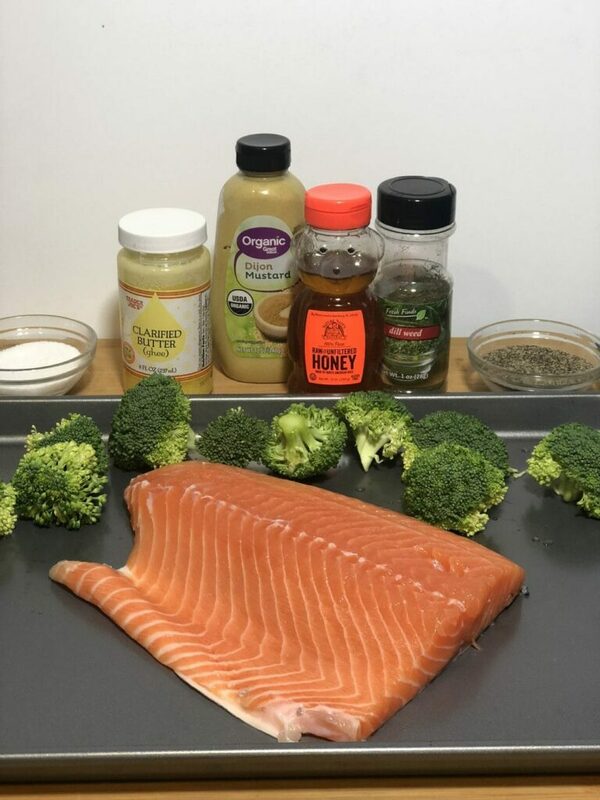 Place the salmon in the middle of the cookie sheet, place the broccoli around the salmon, spray with olive oil and salt/pepper broccoli to taste. I use the EVO oil sprayer to get just enough olive oil on the broccoli, it is one of my favorite kitchen gadgets. Look – all your ingredients on one baking sheet. And when you line it with parchment paper, you save yourself a lot of cleaning hassle too! Now it is ready to bake in the oven for 20 minutes at 350 degrees. Want the complete recipe? Here you go! Make an easy sheet pan salmon recipe on busy nights. This is made with a homemade mustard dill marinade and is ready in 30 minutes. 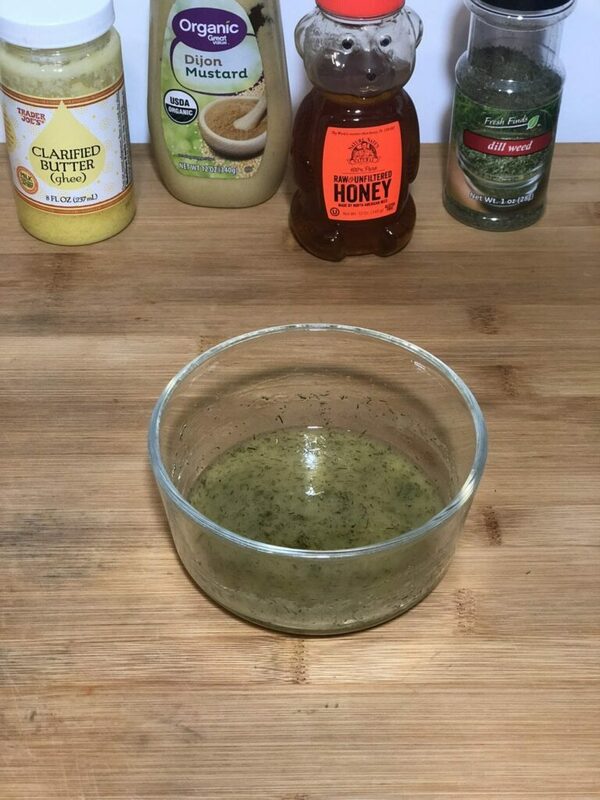 Combine honey, Dijon mustard, and ghee/olive oil, salt, and pepper in a small bowl and whisk. Marinade the salmon with the mustard dill marinade for at least 1 hour. Line a baking sheet with parchment paper. 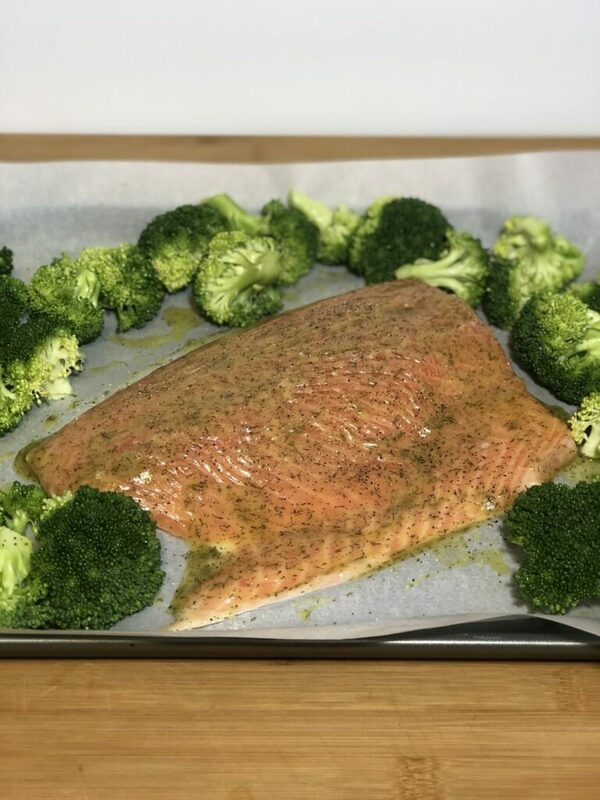 Place the salmon in the middle of the cookie sheet, place the broccoli around the salmon, spray with olive oil and salt/pepper broccoli to taste. Place baking sheet in the oven and bake for 20 minutes or until the salmon breaks apart with a fork and is flaky. What Other Vegetables Go With Salmon? Really any other veggies will taste great on this sheet pan. Try it with yellow squash and zucchini, or even cauliflower and carrots. 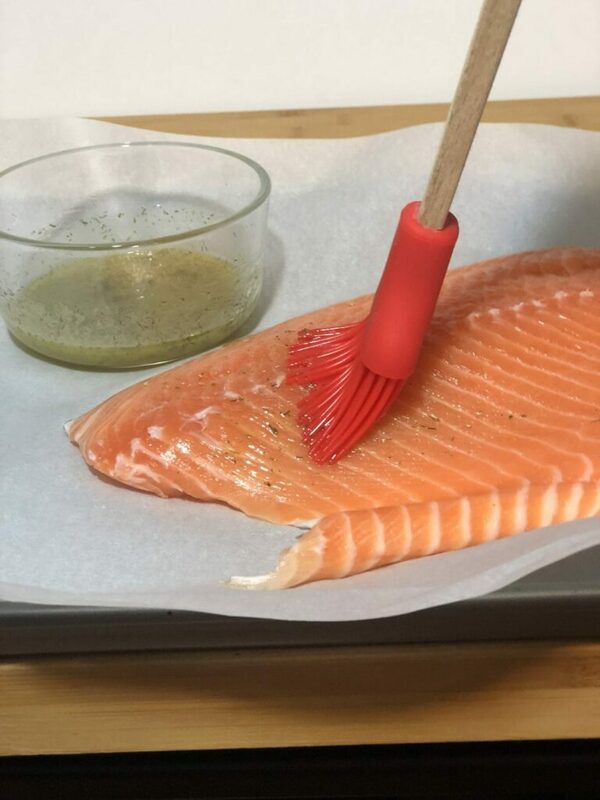 What Sides Do you Fix With Salmon? Try these with your salmon sheet pan dinner for a complete meal. You can always go with steamed white rice, too! You will also enjoy our Honey Balsamic Pan Seared Salmon recipe. It has been shared over 7000 times!